Do language rights fall within this provision? David Leitch and Lorena Fontaine think so. They have been working toward launching a constitutional challenge, arguing that under section 35(1), the federal government has not only a negative obligation not to stifle Aboriginal languages, but also a positive obligation to provide the resources needed to revitalize those languages. The latter claim is the most challenging, while the former is more straightforward. Though the test for establishing a section 35(1) Aboriginal right has ballooned into a labyrinth of steps, sub-steps, and sub-sub-steps, the core of the test has remained relatively constant since the Supreme Court of Canada’s decision in Van der Peet: “in order to be an aboriginal right an activity must be an element of a practice, custom or tradition integral to the distinctive culture of the aboriginal group claiming the right.” Many argue that Indigenous languages easily meet this test. As Leitch puts it, “there is no more distinguishing feature of most cultures than their languages.” Other arguments also focus on the inherent connection between language and culture, as illustrated by the way in which Indigenous languages structure Indigenous knowledge. An additional nuance can be added to this argument. The Supreme Court of Canada’s jurisprudence recognizes that the practices, customs, and traditions protected by section 35(1) include the laws of Aboriginal peoples. At least some Aboriginal languages reflect Aboriginal laws. As Doris Pratt and Harry Bone explain: “Our languages are sacred gifts, given to us by the Creator. They carry our way of life, our views of the world, our history, our laws and they bind us to each other.” Thus, at least some Aboriginal languages are integral to their respective cultures not merely insofar as they reflect those cultures, but also insofar as they reflect the laws that are included within the practices, customs, and traditions protected by section 35(1). An additional argument in support of a positive language right can be deduced from the section 35 jurisprudence itself. The Supreme Court has emphasized that the purpose of section 35 is to promote reconciliation between Aboriginal peoples and non-Aboriginal people in Canada. Section 35 should be applied and interpreted in the light of this purpose. After spending six years gathering over 6,750 statements from residential schools survivors and others, the Truth and Reconciliation Commission of Canada concluded that reconciliation requires the preservation and revitalization of Aboriginal languages, and issued numerous Calls to Action on the topic, one of which states: “The federal government has a responsibility to provide sufficient funds for Aboriginal-language revitalization and preservation.” Language figures prominently in the Commission’s analysis because the very purpose of the residential school system was the destruction of Indigenous cultures and languages for the sake of assimilating Indigenous peoples into non-Indigenous culture. Children were prohibited from speaking Indigenous languages both inside and outside the classroom. As Leitch notes, no “other cultural group in Canada has been subject to a state-sponsored attempt to eradicate its language.” Thus, the case for a positive obligation on governments in this context is compelling. The federal government took active steps to destroy Aboriginal languages, and so reconciliation requires that it take active steps to revitalize those languages. Hopefully Leitch and Fontaine will not need to pursue court action, as the Liberal Party of Canada promised to implement all 94 of the Commission’s Calls to Action, and despite some apparent waffling, the federal government claims to support all articles of the United Nations Declaration on the Rights of Indigenous Peoples (UNDRIP) “without reservation”. Article 13 of the UNDRIP states that “Indigenous peoples have the right to revitalize…and transmit to future generations their…languages” and that “[s]tates shall take effective measures to ensure this right is protected”. In June, Prime Minister Justin Trudeau said he looks forward to discussing the idea of recognizing Indigenous languages as Canada’s official languages, alongside French and English. This language sounds promising, but it is time to move from words to action. See Marie Battiste, Decolonizing Education: Nourishing the Learning Spirit (Saskatoon: Purich Publishing Ltd, 2013) at 140, 144. The Truth and Reconciliation Commission of Canada, Canada’s Residential Schools: The Legacy; The Final Report of the Truth and Reconciliation Commission of Canada, vol 5 (Montreal & Kingston: McGill-Queen’s University Press, 2015) at 112 [TRC Final Report, vol 5]. See Nicola Luksic & Tom Howell, “Constitutional challenge looks to revive aboriginal languages”, CBC News: Aboriginal (10 April 2016), online: <http://www.cbc.ca/news/aboriginal/aboriginal-language-constitution-1.3525982>; CBC Interview, online: <https://majorlaw.app.box.com/s/j5njlltrw9b3pucucec32ndsnj4j8qt5> [CBC Interview]. For the most recent articulation of the “integral to a distinctive culture test”, see Lax Kw’alaams Indian Band v Canada (Attorney General),  3 SCR 353. R v Van der Peet,  2 SCR 507 at para 46 [Van der Peet]. 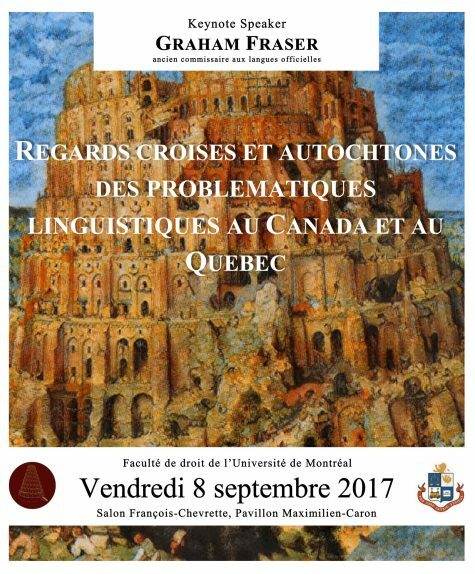 David Leitch, “Canada’s Native Languages: The Right of First Nations to Educate Their Children in Their Own Languages” (2006) 15:3 Const Forum Const 107 at 107. Similarly, the Huffington Post Canada reports that Prime Minister Justin Trudeau recently acknowledged that Indigenous languages “are at the core of indigenous culture and identity”: Chinta Puxley, “Trudeau: Restoring Indigenous Languages ‘Essential’ To Preventing Suicides”, Huff Post Politics: Canada (3 June 2016), online: <http://www.huffingtonpost.ca/2016/06/03/restoring-indigenous-languages-key-to-preventing-suicides-prime-minister_n_10283048.html>. See TRC Final Report, vol 5, supra note 2 at 113; Gabriel Poliquin, “Protection d’une Vitalité Fragile: Les Droits Linguistiques Autochtones en Vertu de l’Article 35” (2012) 58 McGill LJ 573 at 579, 580. See Battiste, supra note 1 at 146. See R v Sparrow,  1 SCR 1075 at 1112; Van der Peet, supra note 6 at para 40; Delgamuukw v British Columbia,  3 SCR 1010 at paras 147, 148 [Delgamuukw]; Tsilhqot’in Nation v British Columbia, 2014 SCC 44 at paras 34, 35, 41 [Tsilhqot’in Nation]. See also John Borrows, Canada’s Indigenous Constitution (Toronto: University of Toronto Press, 2010) at 11. Doris Pratt, Harry Bone et al, Untuwe Pi Kin He – Who We Are: Treaty Elders’ Teachings, vol 1 (Winnipeg: Treaty Relations Commission of Manitoba, 2014) at 69. See Poliquin, supra note 8 at 583, 592. See also Leitch, supra note 7 at 116. Leitch, supra note 7 at 107-108. See CBC Interview, supra note 4. See Leitch, supra note 7 at 116; Poliquin, supra note 8 at 589. R v Beaulac,  1 SCR 768 at para 20. See Van der Peet, supra note 6 at para 31; Delgamuukw, supra note 10 at para 186; Haida Nation v British Columbia (Minister of Forests), 2004 SCC 73 at para 20; Mikisew Cree First Nation v Canada (Minister of Canadian Heritage), 2005 SCC 69 at para 1; Tsilhqot’in Nation, supra note 10 at para 17. See Van der Peet, supra note 6 at para 21. See also Poliquin, supra note 8 at 590-591 (arguing that section 35(1) has a remedial purpose which supports an argument in favour of a positive right to language under section 35(1)). See The Truth and Reconciliation Commission of Canada, Honouring the Truth, Reconciling for the Future: Summary of the Final Report of the Truth and Reconciliation Commission of Canada (2015), at 25. The Truth and Reconciliation Commission of Canada, Calls to Action (2015) at #14. See also Calls to Action #10 and #13, ibid. Leitch, supra note 7 at 5. See TRC Final Report, vol 5, supra note 2 at 121. See Luksic & Howell, supra note 4. Liberal Party of Canada, “Truth and Reconciliation”, online: <https://www.liberal.ca/realchange/truth-and-reconciliation-2/>. See Kristy Kirkup, “Government supports Indigenous declaration without reservation: Wilson-Raybould”, CBC News: Aboriginal (20 July 2016), online: <http://www.cbc.ca/news/aboriginal/government-supports-undrip-without-reservation-1.3687315> (reporting that federal Justice Minister Jody Wilson-Raybould stated at the 2016 annual meeting of the Assembly of First Nations that “‘simplistic approaches’ like adopting the United Nations Declaration on the Rights of Indigenous Peoples into Canadian law are ‘unworkable’.”). See Puxley, supra note 7. This content has been updated on 22 September 2016 at 13 h 04 min.